Roller skating has been around for longer than most people think. It’s roots date all the way back to the 1700’s! With such a rich and long history, it can be hard to remember all of the highlights, from its origins to now. That’s why Skate Moore, located in Moore, Oklahoma, has created an easy to follow timeline for you roller skating history buffs. 1743: This is the first ever recorded account of anyone using anything like roller skates. These first skates were used in a London stage performance, and the inventor is unknown. 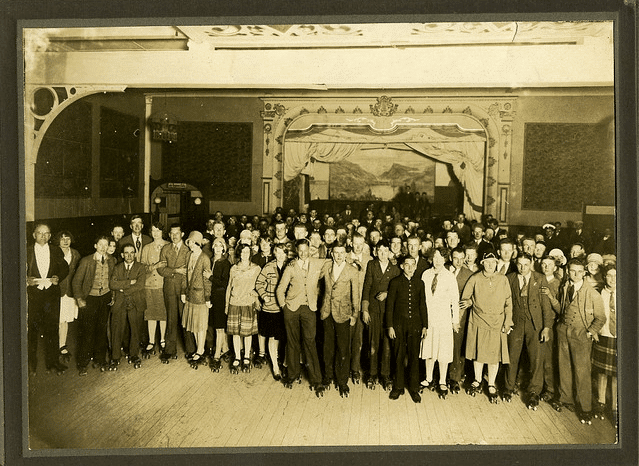 1760: The first roller skates are invented! Though the first account was in the stage performance, this is the first ever actual invention of what we know today. These skates were actually inline, believe it or not, and had small metal wheels. The inventor was John Joseph Merlin. 1857: Roller skating has finally gained enough popularity by this point and has warranted the opening of the first public rinks! They were held at The Strand in London and Floral Hall. 1863: The quad roller skate makes its first appearance. Designed by James Leonard Plimpton in New York City, this model of roller skate made it easier for the skater to turn. 1880: Roller skates are beginning to be mass produced in America, and is experiencing a boom in popularity. 1979: Scott Olson and Brennan Olson set out to redesign the skate by using a 1960’s inline skate design and using modern materials and an ice hockey boot. Scott Olson begins promoting the skate, and creates Rollerblade, Inc. Adjustments to the skates are made over the course of the next decades, and with a bit of tweaking and honing, we have arrived at what we have today!